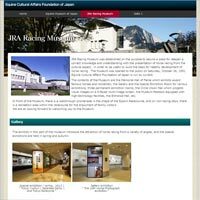 *JRA Racing Museum is one of JRA's institutions. JRA Racing Museum is Japan Racing Association's corporate museum, aiming to attract the visiting racing fans at Tokyo Racecourse. In 1984, as part of the JRA's 30th anniversary project, the Memorial Hall was set up within the JRA Racing Museum to honor Hall of Fame Horses. In 2004, in part of its 50th anniversary project, similar expansion to the Memorial Hall followed to honor Hall of Fame Horsemen (trainers and jockeys) . Solely dedicated to horseracing, JRA Racing Museum offers a comprehensive exhibit of the accomplishments of past top-tier horses, historical developments of horseracing, and the overall functionality and structure of today's horseracing. The museum has also taken in modern high-technology, such as videos and robots, to entertain the visitors.